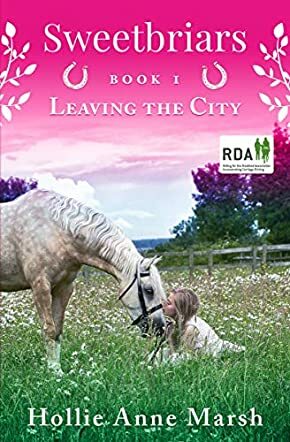 Sweetbriars: Leaving The City by Hollie Anne Marsh tells the story of Cate and her family as they move to a new home in the countryside, far away from her friends and all that is familiar. The plan is to set up an equestrian centre, but Cate is not sure she shares her family’s dream. It’s a wrench for her, and it takes time for her to settle. She is helped by her beloved horse, Odette, and soon makes a special friend at school, and also at the Pony Club. The transition is helped by the fact that she totally falls in love with Sweetbriars. The story follows Cate as she and her family work together to make Sweetbriars a success. The author, Hollie Anne Marsh, has written a lovely story that is sure to appeal to horse lovers everywhere, and is ideal for the eight to twelve age range. The reader is carried along into Cate’s world, feeling her anxieties and delights, and empathising with her as she struggles to adjust to her new life. Sweetbriars is well described in visual detail, leaving the reader feeling as if they have been there. It sounds like every young horse lover’s dream home. Cate is a believable and likeable character who appeals to the reader, and her lovely Palomino horse, Odette, will have the horse enthusiasts drooling. A steady pace and a lovely and consistent story that will transport the horse devotee to a world surely every young equestrian enthusiast will crave. The first of a series, Sweetbriars is the stuff of horse lovers' dreams.